With an endeavour to expand its innovative solutions, Meril introduces revolutionary Cardiovascular Suture Range that comprises some of the most preferred suture codes of Cardiovascular Surgeons. The broad gamut has more than 90 codes including those of FILAPROP (Polypropylene), FILAPROP P (Polypropylene with pledgets), MERICRON XL (Polyester), MERICRON XL P (Polyester with Pledgets) and MERISTEEL (Steel) to meet all the cardiovascular surgical needs. 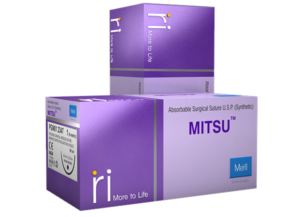 o MITSUTM is a mid-term absorbable braided and coated synthetic suture made of poly (glycolide-co-l-lactide)(90/10). MITSUTM degrades by hydrolysis and assures predictable and reliable absorption. Made from copolymer of 90% glycolide & 10% lactide, MITSUTM(Polyglactin 910) suture is available as dyed and undyed. MITSUTM contains only FDA approved colour additives. 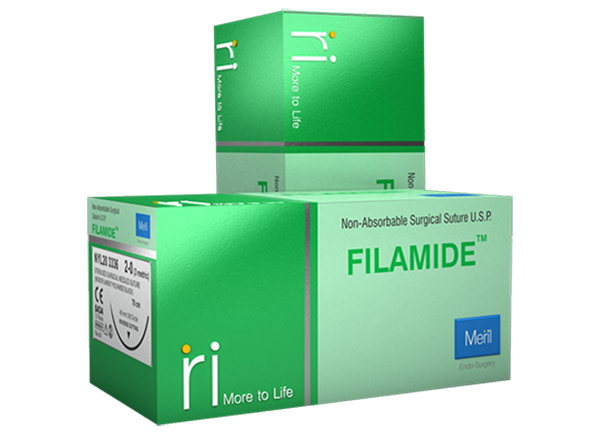 The suture coating is a mixture composed of copolymer of glycolide and lactide (Polyglactin 370) and Calcium stearate. o FILAPROPTM polypropylene suture is a non-absorbable, sterile surgical suture made of an isotactic crystalline stereoisomer of polypropylene, a synthetic linear polyolefin. The suture is pigmented blue to enhance visibility. FILAPROPTM is also offered in Less Memory Tray (LMT) as well as in long folders to avoid the memory effect. o MERICRON XLTM Polyester suture is a non-absorbable synthetic braided suture composed of Poly (ethylene terephthalate). 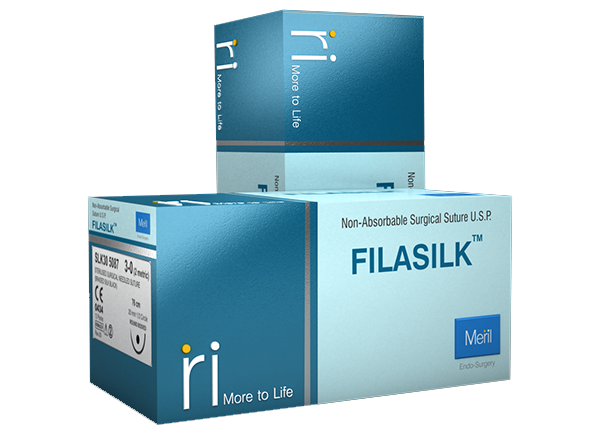 Its high quality material combined with precise braiding mechanism nearly eliminates the occurrence of post-operative suture fragments in the tissue. Unlike absorbable and some non-absorbable sutures, MERICRON XLTM polyester surgical suture does not \ show any significant change in tensile strength retention known to occur in vivo. The Meril Cardiovascular Suture Range presents a broad spectrum of polyester sutures and even includes those with pledgets (MERICRON XLTM P). o MERISTEELTM suture is a non-absorbable monofilament suture made from 316LVM stainless steel. It is indicated for use in orthopaedic procedures and sternum closure in cardiovascular surgeries.